We have examined, so far as material is available in the Departments concerned, the authenticity of the Zinovieff letter, but find it impossible on the evidence before us to come to a positive conclusion on the subject. We have had enough evidence to show us the existence of habitual attempts in Russian matters to pass off forgeries as authentic documents and to use such for political purposes. 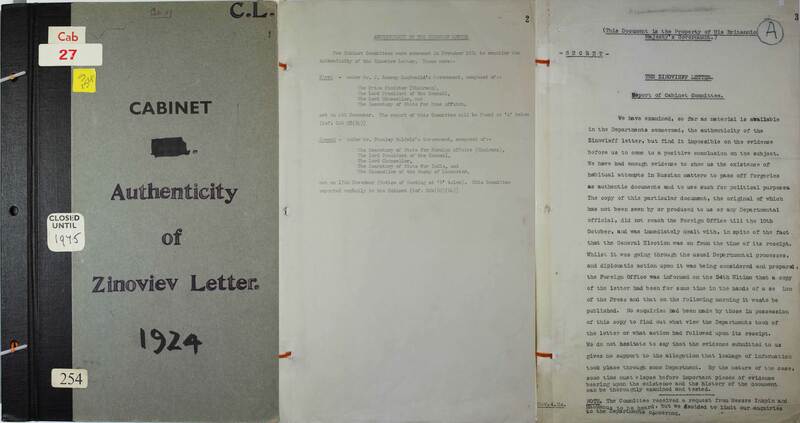 The copy of this particular document, the original of which has not been seen by or produced to us or any Departmental official, did not reach the Foreign Office till the 10th October, and was immediately dealt with, in spite of the fact that the General Election was on from the time of its receipt. Whilst it was going through the usual Department processes, and diplomatic action upon it was being considered and prepared, the Foreign Office was informed on the 24th Ultimo that a copy of the letter has been for some time in the hands of a section of the Press and that on the following morning it was to be published. No enquiries had been made by those in possession of this copy to find out what view the Departments took of the letter or what action had followed upon its receipt. We do not hesitate to say that the evidence submitted to us gives no support to the allegation that leakage of information took place through some Department. By the nature of the case some time must elapse before important pieces of evidence bearing upon the existence of the history of the document can be thoroughly tested. Nov.4.24 NOTE. The Committee received a request from Messrs Inkpin and MacManus to be heard but we decided to limit our enquiries to the Departments concerned.